To maintain populations of microbial cells under controlled conditions of growth and environment for an indefinite duration is a prerequisite for experimentally evolving natural isolates of wild-type species or recombinant strains. This goal is beyond the scope of current continuous culture apparatus because these devices positively select mutants that evade dilution, primarily through attachment to vessel surfaces, resulting in persistent sub-populations of uncontrollable size and growth rate. To overcome this drawback, a device with two growth chambers periodically undergoing transient phases of sterilization was designed. The robustness of this device was assessed by propagating an E. coli strain under permanent thymine starvation for over 880 days, i.e. metabolic conditions notoriously known to lead to cell death and clogging of cultivation vessels. Ten thousand generations were required to obtain a descendant lineage that could resist thymine starvation and had recovered wild-type growth rate. This approach provides a technological framework for the diversification and improvement of microbial strains by long-term adaptation to inescapable metabolic constraints. An E. coli strain that is totally resistant to thymineless death was selected. Experimental evolution of microorganisms is a field of vast potential for both fundamental and industrial purposes. Genetic engineering masters the modular assembly of genes and their products, but it is by selecting for the enhancement of the overall fitness of recombinant organisms that we can most readily improve the functional integration of such assemblies. Studies of experimental evolution have, however, been hindered by difficulties maintaining large populations of microbial cells under controlled internal and external conditions for numerous generations. The long-term proliferation of microorganisms is covered by a body of knowledge known as continuous culture [1, 2], technically and theoretically established around the equivalent Monod's bactogene  and Novick's and Szilard's chemostat . Basically, these devices operate by renewing a liquid culture of constant volume with nutrient medium inflow, such that microbes must counteract dilution by growing at least at an equal rate [1, 2]. Mutants proliferating at higher growth rates are selected during prolonged operation of these devices [1, 2]. The advantages of continuous culture systems to perform experimental evolution studies (control, mathematical modeling, absence of bottle-necks, high number of generations per day) were discussed previously by several authors [3, 5, 6]. However, various undesired survival mechanisms can predominate in continuous cultures through attachment to the culture vessel and selection of static variants evading dilution rather than overcoming it [7, 8]. This phenomenon is often referred to as wall growth [1, 2, 6]. For these reasons, the most extensive experiment of microbial adaptation to the laboratory reported so far (20000 generations of E. coli growth during 10 years) was conducted by manual serial sub-culturing in common microbiology glassware and not by automated propagation in continuous culture equipment [9–11]. To overcome many of the drawbacks of continuous culture, a device with two growth chambers that preserves a proliferating culture while subjecting all parts in contact with the culture to transient sterilization over its operation cycle, was designed and constructed. In effect, adherence is actively counter-selected in the device, and cell populations can be propagated in suspension for indefinitely long duration. This device was utilized for 880 days to evolve a thymine-requiring E. coli strain under limiting thymine supply. Shortage of thymine is known to entail cell lysis in E. coli and proves challenging in continuous cultures because debris can rapidly clog fermenter tubing, thereby stopping operations. Thymine starvation provides an experimentally convenient means to maintain a metabolic constraint on the structure of the E. coli genome. In order to reduce the amount of dTMP required for cell division, three mechanisms can be anticipated: 1) Iterative substitution of TA or AT pairs to GC or CG pairs eventually yielding a GC rich genome as in the evolution of the mutT strain . 2) Iterative deletion of non-essential genes to eventually yield a trimmed genome. 3) Incorporation of an ersatz of dTMP during DNA polymerization, e.g. dUMP [14, 15] or 5-hydroxymethyluracil  eventually yielding chemically remodeled genomic material. Assessing the occurrence of such evolutionary processes, in real time, would be of interest in any of these cases. 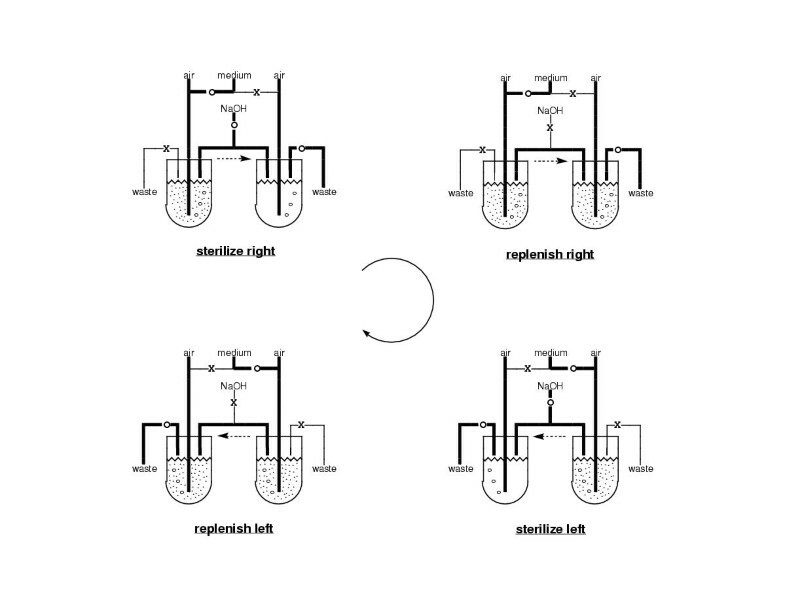 In principle, an ever-clean chemostat could be set up by periodically swapping a culture between two growth chambers that are symmetrically connected and equipped with independent inflow and outflow lines. An automated device implementing this procedure with a dozen electrovalves for controlling the fluid traffic is described by Marlière and Mutzel . In the course of elaboration of this device, a simpler apparatus using only five electrovalves was set up to be subjected to hard case testing. It consists of two growth chambers between which the nutrient flow is periodically reversed (Fig. 1). A constant nutrient flow runs through an upstream growth chamber and then through a downstream growth chamber of identical volume before exiting the device. When a massive dose of sterilizing agent is briefly injected in the line bridging the left and right chambers of the setup, all cells of one chamber (downstream) are destroyed without affecting those in the second chamber (upstream). Following this episode continued overflow from the upstream chamber restores viable conditions in the downstream chamber by diluting out the lethal agent and replenishing it with living cells from the upstream chamber. At this stage, the nutrient flow can be reversed, such that the sterilization process can be repeated with the second chamber. Cyclic inversion of nutrient flow, followed by injection of the lethal agent ensures that all parts of the device in contact with the cultivated organism are sterilized in turn (Fig. 1). Cells that proliferate exclusively by attaching to or remaining in any part of the vessel are completely destroyed during each operation cycle, thus actively counter-selecting static variants. In contrast, cells that perfectly disperse in suspension are not subject to destruction by the sterilizing agent and flow freely from one chamber to the other. This apparatus allows to really implement experimental evolution protocols as selective conditions can be maintained for an indefinite period of time. Operation cycle of an alternating tandem chemostat. Wavy lines, dots and circles in growth chambers represent culture level, live bacteria and air bubbling respectively. The letters 0 and X indicate open and closed valves, respectively. Lines carrying mixed gaseous-liquid flows are in bold. In the tube that connects the two chambers, the dotted arrow indicates the direction of flow. Sterilization and replenishment phases have respective durations of 20 mn and 47 h 40 mn. During each cycle, both growth chambers, their effluent lines and the bridging line are transiently flooded with 10 N NaOH, destroying all cells attached to any part of the device. Concentrated sodium hydroxide was chosen as the sterilizing agent because of its insuperable killing potency against bacterial cells, its high potency for cleaning vessel surfaces, and its ready disposability under non-polluting form. The choice of concentrated alkaline solutions also seemed pertinent for confining recombinant organisms and containing the dissemination of genetic markers, as such solutions degrade nucleic acids to nucleosides. Shortage in thymine entails rapid lethality in living cells [12, 18]. In E. coli it can be enforced irreversibly by a deletion of thyA, the gene encoding thymidylate synthase, which cannot be suppressed by any known mutation . The E. coli strain β7328 of genotype ΔthyA ΔdeoCABD p::deoA+ lacking thymidylate synthase, phosphodeoxyribose aldolase, phosphodeoxyribose isomerase and overproducing thymidine phosphorylase was constructed (as described in the protocol section) to enforce an absolute requirement for low concentrations of exogenous thymine (Fig. 2) : a minimum of 5 μM (1.25 μg/ml) thymine was necessary for optimal proliferation. Batch cultivation with 1 μM (0.25 μg/ml) thymine resulted in a brief episode of growth followed by death and accumulation of cell debris. These values match those published for low thymine-requiring auxotrophic mutants carrying mutations in thyA and either in deoB or deoC. Thymine and thymidine metabolism in strain β7328 (ΔdeoCABD thyA::Erm p::deoA+) Abb. : dR1P, deoxyribose-1-phosphate; dR5P, deoxyribose-5-phosphate, T, thymine; dT, thymidine; dUMP, uridilate; dTMP, thymidilate; dTDP. Strain β7328 was used to inoculate a culture in MS minimal medium containing 10 mM glucose and 1 μM thymine at 37°C; this culture was transferred in the device described above. The dilution rate (setting the generation time) was set to four hours during the first month and two hours thereafter. Over the first 30 days, the population underwent a regime of wide oscillations in bacterial density (data not shown), reflecting episodes of growth and lysis due to thymine shortage. 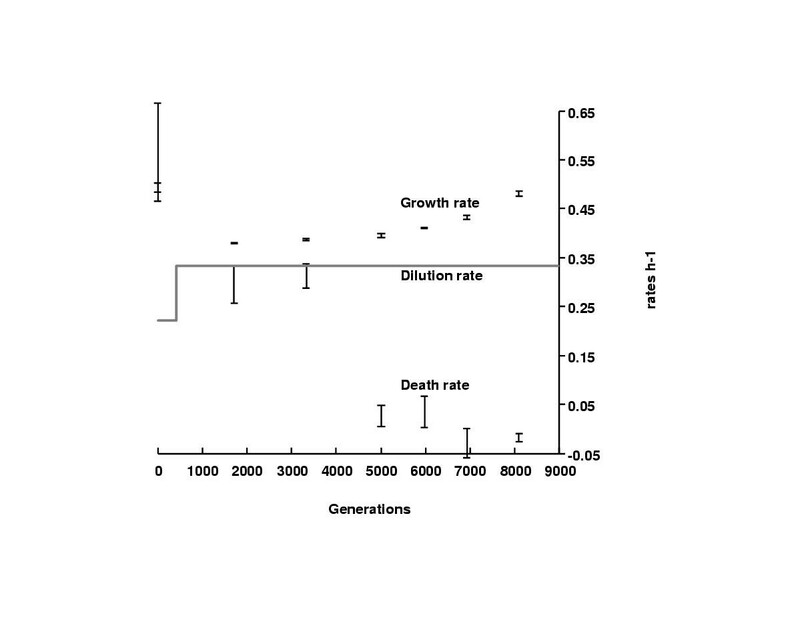 The thymine auxotrophic population proliferating in the device then underwent a progressive increase in biomass, from an OD (A600nm) lower than 0,005 to an OD of 1.2 reaching a plateau at around 1700 generations (Fig. 3). Biomass oscillated around 0.955 OD (A600nm) until generation 7500 and then oscillated around an OD of 1.1 until the culture was stopped after having been maintained for 880 days and just over 10000 generations. 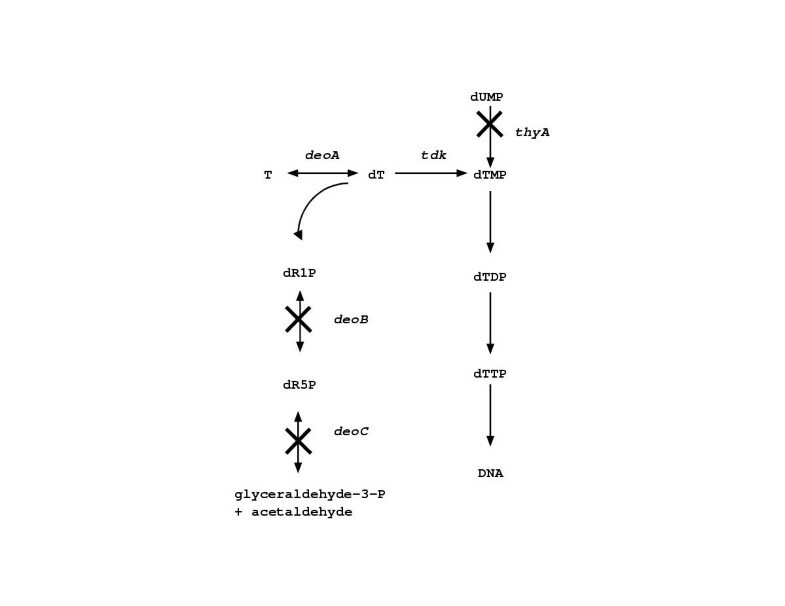 All descendent strains isolated from the chemostat culture were still thymine auxotrophs, demonstrating that no novel biosynthetic pathway to dTTP arose over the course of the experiment. Six samples corresponding to generations 1710 (γ1710), 3330 (γ3330), 5010 (γ5010), 5982 (γ5982), 6930 (γ6930), and 8094 (γ8094) respectively, were further analyzed. 10000 generations in a thymine limiting (1 μM) chemostat. The OD (A600nm) was measured by sampling. In order to estimate the number of mutations accumulated in the descendents, the capacity to utilize 100 different carbon sources was monitored (Table 1). A progressive loss of metabolic capabilities was observed with passing generations. These phenotypes were confirmed by comparing the growth of the input and output strains on solid minimal medium containing 0.2% of the different carbon sources. Fifty individual clones isolated from each sample were found to be genetically homogeneous, suggesting that the output populations were clonal at different sampling times. Monophyletism of the chemostat population was therefore postulated hereafter. After 1722 generations, 15 substrates out of 100 tested could no longer be utilized. If the tested phenotypes were independent as assumed in Table 1, this would give a 15% observed probability of pathway inactivation. The phenotypes are clearly not independent. For example, a mutation in the dct gene, encoding for the dicarboxylate transport, could be responsible for the growth deficiencies of the descendents on malate, succinate and aspartate . Examination of the pathways for the 15 substrates , suggest that 8 phenotypes must be caused by independent mutations. A similar analysis of the 100 phenotypes tested yields an estimate of 60 independent phenotypes. As 15/100 and 8/60 give similar values we decided to make the assumption of independence. We can therefore estimate that 20 to 200 times more mutations are observed than expected from genetic drift (Table 1). In the following generations (except between γ3330 and γ1710), the observed mutation probability is just slightly higher then the predicted (Table 1). These estimations suggest that the accumulation of mutations is a selected trait in the first 2000 generations, but it remains to be determined by closer studies if this trait is still selected from 2000 onwards. It is clear from these results that most catabolic losses occurred in the early stages of the evolution experiment as previously observed by Cooper and Lenski . This progressive loss of traits could be caused either by T substitutions or T deletions as discussed earlier. The identification of the type of inactivating mutation (deletion or substitution) will be the object of a separate report once the genomes of the evolved strains have been resequenced. Survival via replacement of dTMP by dUMP was not observed and might need further commitment in the construction of a strain containing the dut ung alleles encoding dUTPase and Uracil-DNA-glycosylase respectively [14, 15], so that misincorporated U's are not repaired. Growth on 100 different carbon sources was monitored using API100™ kits (Bio-merieux). Observed phenotypes are designated by +(growth) and – (no growth). The mutation probabilities were calculated as follows: an average pathway for carbon source utilization contains from 1 to 10 pathway specific genes (10 to 104 bp). The mutation rate per bp per generation in E. coli is 5.4 10-10 and if the assumption is made that every mutation is inactivating (which is the most conservative hypothesis), the probability of acquiring a mutation in a given pathway after X generations by genetic drift is X 5.4 10-10 103 or 4. As the mannose-deficient-phenotype can be due to a mutation in manA, manXYZ or, nagC corresponding to 4128 bp , this value was used for the mutation probability between γ5010 and γ8094. We then approximated the values of αmax and θmax from the output cultures isolated from the chemostat. αmax was estimated by monitoring the growth rates of the output strains in batch cultures at high thymine concentrations (10 μM) and θmax by monitoring death rate in the absence of thymine. As shown in Fig. 4, the more generations elapsed, the more resistant the descendants became to thymineless death until γ6930 and γ8094 became totally resistant to thymine shortage. Concomitantly, the maximum growth rate in the presence of excess thymine decreased by 50% in γ1710. The growth of this strain is hardly superior to the dilution rate as shown in Fig. 4. Should it have been lower, the evolvant would have not been maintained and would have been eliminated by dilution. Then, a gradual increase in maximum growth rate was observed in the descendents until the initial maximum growth rate of β7328 was recovered in β6930 (4). Evolution of maximum death and growth rates. Each experimentconsisted of simultaneous measurement of the growth rates (or death rates) for the wild-type strain and the six output strains. Mean values of three independent experiments for each data point are presented. Directed evolution was automatically conducted for 880 days under permanent metabolic constraint using a new continuous culture device that enables selection of E. coli strains that are totally resistant to thymineless death. Thus, a long awaited tool allowing strain improvement by experimental evolution has been constructed and successfully tested. The systematic elimination of static variants that escape dilution by attaching to the vessel now allows the possibility to maintain cultures under defined conditions indefinitely. Chemostats shorten the time of long term experiments, compared to manual transfer, and can be easily automated so that many cultures are conducted in parallel. The automation and robustness of the device should allow many applications in the biotechnology field. Bacteria were routinely grown in mineral standard (MS) medium  containing 2 g glucose/liter with or without thymine (1 to 10 μM) or in LB medium . Growth media were solidified with 15 g/liter agar (Difco) for the preparation of plates. Transformations and PI transductions were performed following standard procedures [25, 26]. The utilization of 100 carbon sources was tested using the ApiBiotype100™ system (BIO-MERIEUX), under conditions recommended by the manufacturer. Strain β2033  was used for cloning. Strain β7328 was constructed as follows. The thyA::erm+ marker from β1308  was introduced by PI transduction in the ΔdeoCABD strain β7077 , selecting for erythromycin resistance (400 μg/ml) in the presence of 300 μM thymidine. Next, the ΔdeoCABD thyA::erm+ strain was transformed with p::deoA+ to give β7328 used to inoculate the chemostat. The p::deoA+ plasmid was constructed as follows. 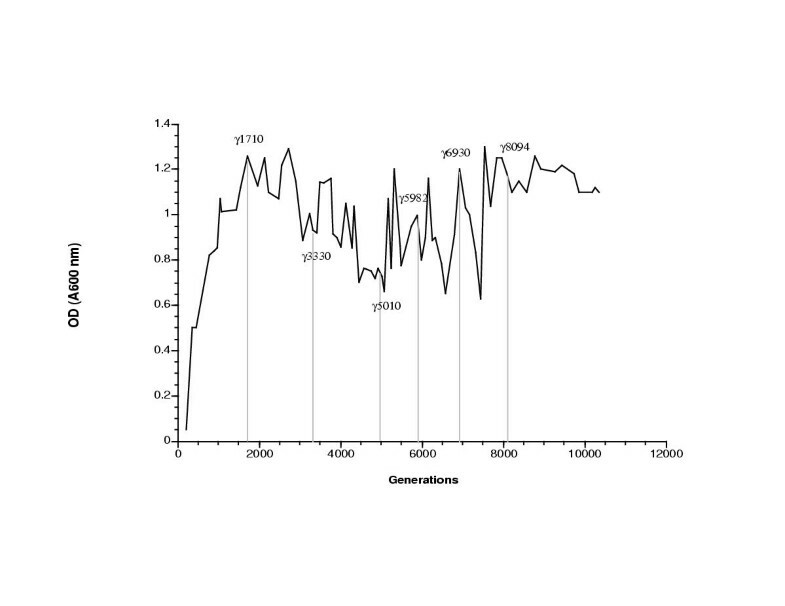 A 1.3 kb fragment containing the deoA gene was PCR amplified from MG1655 chromosomal DNA using the following oligonucleotides: ol1 gcgcccgggaggttaccttgtttct, ol2 gcggaattcgttattcgctgatacggcgat and standard conditions using Vent™ Polymerase (New England Biolabs, Beverley MA). The fragment was digested by SmaI and EcoRI and cloned into pTZ19 (Pharmacia) digested by the same restriction enzymes. p::deoA+ plasmid was verified by sequencing and allowed the ΔdeoABCD ΔthyA strain to use thymine as a thymidine source (Fig. 2). An alternating tandem chemostat was implemented using continuous culture modules  elaborating on published techniques [29, 6]. Thus, twin growth chambers of the bubble-column type , each holding a 20-ml culture were set up in glass tubing connected with Teflon and silicon rubber lines and placed in thermostated blocks. Sterile nutrient flows from a pressurized Mariotte reservoir (0.3 bar atmospheric pressure) were regulated by capillary Teflon tubing [1, 29], mixed with sterile airflow, and injected at the bottom of the growth chamber within the culture . Flows in the nutrient and effluent lines were controlled by an array of pinch valves connected to an automaton (both purchased from Bürkert GmbH, Germany). The flow of sterile air was not subject to control and maintained in both chambers without interruption. The device was also equipped with a valve-controlled line delivering 10 N NaOH in the line bridging the two growth chambers. Restoration of the growth conditions was effected by continued dilution of the downstream chamber with the outflow of the upstream chamber. Sterilization phases were programmed to recur at the highest frequency compatible with a safe propagation of the culture, i.e. one nutrient flow reversal and one sterilization phase per 48 h for a 2-h generation time. The equations for growth in a two-stage single stream chemostat with chambers of identical volume (P. Marlière, unpublished results) showed that the value for the growth rate at equilibrium is the dilution rate like in a classical chemostat . The population size can be estimated to 1010, knowing that the vessel holds 20 ml of bacterial culture and the OD (A600 nm) oscillated around the value of 1 which corresponds to 5 108 cells/ml. Growth rates were determined by measuring the optical density (A600nm) of at least five successive samples taken from cultures in balanced growth in MS glucose medium supplemented with 10 μM thymine at 37°C. Single clones reisolated after plating the output samples were used. Death rates were determined as follows. Cells grown in MS glucose supplemented with 10 μM thymine were harvested in late exponential phase, washed three times with MS and used to inoculate 50 ml of MS glucose. At different time points aliquots were taken and viable counts were measured by plating dilutions on MS glucose/10 μM thymine. Death rates were measured by approximating a linear decrease in viability between 1 and 3 hours. We would like to thank J. Weissenbach, M. Goldberg, D. Malchow and P Schimmel and for their encouragements, M. Bouzon for cloning of the deoA gene, T. Hendrickson for extensive help with the manuscript, and D. Metzgar for his helpful comments.